Brooklyn was the place to be for outer borough lenders last month. The borough took seven out of the top 10 spots for the largest outer borough loans in March. It also grabbed the top overall spot thanks to a $200 million loan from Santander Bank for John Catsimatidis’ project at 86 Fleet Place in Downtown Brooklyn. Queens took two spots, including the No. 2 loan of $165 million from Morgan Stanley for Heatherwood Luxury Rentals’ building at 42-12 28th Street in Long Island City. The Bronx took the remaining spot on the list, while Staten Island did not make the cut. The top outer borough loan last month was $200 million from Santander Bank for John Catsimatidis’ Red Apple Group. The money is for the firm’s Downtown Brooklyn project the Eagle, a 440-unit, 32-story project at 86 Fleet Place. The debt from Santander replaces $170 million in financing that the project received in 2015 from Bank of America. 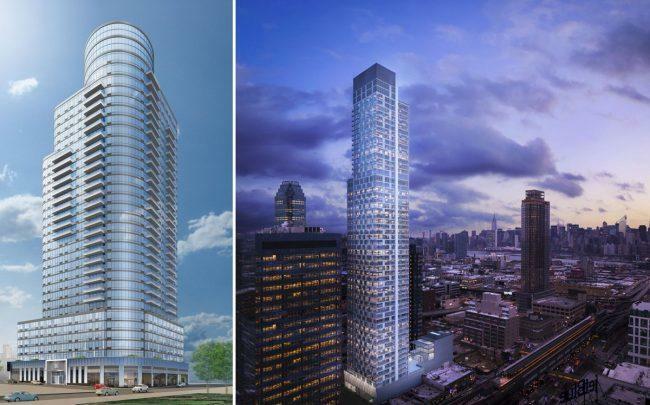 The second place loan went to the tallest residential tower in Queens: Heatherwood Luxury Rentals’ 58-story Tower 28 building in Long Island City’s Queens Plaza. Morgan Stanley loaned the firm $165 million for the 58-story, 451-unit building, replacing a 2015 loan from PNC Bank for $154 million. Heatherwood bought the site at 42-12 28th Street in 2011 for $12.6 million and bought additional air rights in 2013 for $10.2 million. RXR landed a $157 million loan from Bank of America to refinance its 470 Vanderbilt Avenue leasehold in Clinton Hill. The package includes a $15 million gap mortgage. RXR bought the office building in 2014 for about $195 million, one of the largest office deals the borough has ever seen. Tenants include the New York City Housing Authority and the New York City Human Resources Association. Capital One loaned $135.4 million to Cammeby’s International Group to refinance Shorecrest Towers, a massive apartment building that the late Fred Trump put together in the 1960s. The buildings have more than 880 apartment units combined and are located at 2940 and 3000 Ocean Parkway. The 23-story complex is just two blocks from the beach on Coney Island. The Bronx made its first appearance on the list thanks to a $75.9 million loan Treetop Development received from Wells Fargo for its Bronx affordable housing complex at 1600 Sedgwick Avenue. The bank provided Treetop with a Freddie Mac mortgage for the 25-story, 383-unit building, located in Morris Heights near the Major Deegan Expressway. Quinlan Development Group landed a $75 million loan from TD Bank for its mixed-use project at 415 Red Hook Lane. The deal replaces debt from M&T Bank and includes a gap mortgage for almost $22 million. The building is known as the Lane at Boerum Place and stands 21 stories tall with 108 rental apartments. Prime Storage landed the No. 7 spot with a $62 million loan from AIG for 62 Imlay Street in Red Hook. The company purchased the 223,000-square-foot warehouse from the Fruchthandler and Schron families for $100 million in March. It is currently used as storage space for the auctioneer Christie’s. A company linked to developer Jonas Rudofsky also received a $62 million loan last month for a new Emblem Health building at 101 Pennsylvania Avenue in Cypress Hills, according to Law360. The loan came from Athene Annuity and Life Company. AIG loaned HUBB NYC Properties $51 million for its purchase of 31-57 31st Street in Astoria, a new 114-unit multifamily building. HUBB bought the property from Mega Contracting Group and Treeline Companies for $75 million, making it the priciest multifamily deal Queens has seen so far this year. The building stands seven stories tall and spans 100,000 square feet. March’s list closes out with a $45 million loan from M&T Bank to Acadia Realty Trust for 138 Willoughby Street in Downtown Brooklyn. The deal was for a mortgage on a retail lease.